If Travis Shaw can get a starting spot for the Red Sox, it would probably be third base. 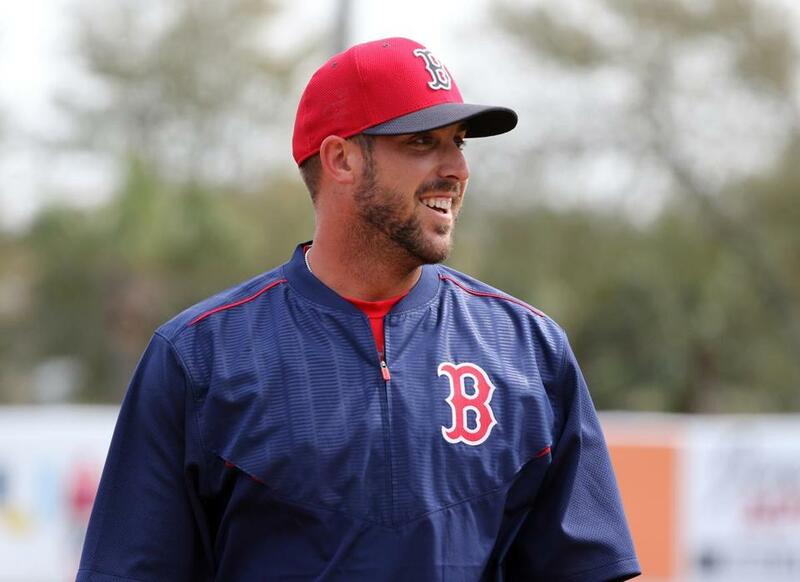 PORT CHARLOTTE, Fla. — Travis Shaw has started six games for the Red Sox during spring training, five of them at third base. All but five of the 29 innings he has played defensively have come at third. That is partly because the coaching staff saw plenty of Shaw at first base last season and has confidence in his skills there. But it’s also increasingly clear the Sox are developing Shaw as a viable alternative to replace Pablo Sandoval at third base should that become necessary. He certainly appears ready offensively. Shaw was 2 for 4 with a double in Sunday’s 13-5 loss against the Tampa Bay Rays. He is 12 of 23 with two doubles, two home runs, and nine RBIs over eight games. A 1.430 OPS demands attention, even if it’s for eight games in spring training. Putting the best team on the field would mean having Shaw at first or third base. But lineup decisions are not always based on merit. Sandoval has four years and at least $75 million remaining on his contract. First baseman Hanley Ramirez has three years and $66 million. Trading Sandoval or Ramirez, something the Red Sox investigated during the winter, would be close to impossible at this point of the season. So starting Shaw would require benching a player making $22 million (Ramirez) or $17 million (Sandoval). Typically, an established player with a high salary will stay in the lineup for at least a third of the season before a team would consider making a change. But the Red Sox have finished in last place two years in a row and manager John Farrell might not survive a slow start. The Sox also play 16 of the first 26 games against division foes. If Shaw can get a spot, it would probably be third base. Sandoval is 2 for 16 in seven games and has not played well defensively after reporting in what appeared to be poor condition. Ramirez is 5 of 15 in six games and has put in earnest effort to learn first base, even if the results have not always been smooth. Shaw has worked hard at third base and shown he can handle the position. He started five games there last season after making 102 starts at third in the minors. The 25-year-old Shaw will soon start to play some games in left field to increase his versatility. Even if he is not a starter, he could start two or three games a week at different spots. Maybe more. Shaw had an .813 OPS in 65 games last season, playing first base regularly over the final two months of the season. He hit 13 home runs and added some life to the final weeks of the season along with the other young players on the roster. The Red Sox sent Shaw to play in the Roberto Clemente winter league in Puerto Rico to get some work at third base, but an injured right shoulder limited him to one game. Shaw made up for that quickly in spring training. Once Shaw got over his shoulder injury, he prepared for the season by sharpening his eye with extra rounds of batting practice. The idea was to arrive at camp ready to play and compete for a job. Shaw took swings off his father, former major league pitcher and two-time All-Star Jeff Shaw. At 49, Papa Shaw can still bring it, albeit from closer than 60 feet, 6 inches. Shaw is from Washington Court House, Ohio. The Sox open the season in Cleveland, about three hours away. He hopes to give his family a good reason to come to the game.